Whether 2017 was filled with good times and perfect vacations, or existential dread and airport delays, it’s time to put the year in the rear view and take a look at the next 365 days. No year is more promising than when you’re booking your travel for it: Wide open schedules, endless possibilities, and big, big dreams. For 2018, certain trends in travel are already starting to make themselves known. If you want to know the types of trips about which your donors might be thinking, you may think about it through the lens of one of these inclinations we’re seeing for the new year. The AARP puts together its own list of travel trends each year, taking into account the whole range of travelers, but focusing on seniors. For 2018, the organization says that more of its members will be traveling for relaxation (49 percent) than in 2017. Similarly, “get away from everyday life” also saw a bump in percentages, with 47 percent of respondents mentioning it as a reason for hitting the road. American Express’s travel unit is reporting a 44 spike in international booking for the first quarter of 2018, according to a company press release. A potential reason: More and more travelers (72 percent, in this survey) say that they enjoy learning about different cultures while on vacation, and 25 percent say that learning about history, art and culture is the most important travel goal for 2018. Families traveling together will still be popular in 2018, and its joys aren’t limited to the grandparents. Pop culture website PopSugar, which aims at teens and twentysomethings, put together its own top 10 travel trends list, and multigenerational travel took the second spot. Trips like cruises or accommodations like villas make for great family reunion staging points – there’s something for everyone, and enough room for everyone to have some privacy, too. Those not interested in traveling abroad are seeking out American cities, but not just for the major attractions, according to the Editor-in-Chief of National Geographic Traveler. Instead, vacationers are looking for those locals-only secrets: the hole-in-the-wall restaurant with gnocchi to die for, or that speakeasy with the secret entrance. It gives the visitor to meet locals and chat, learning about a new place through its people and not just its buildings. Hitting the road for the perfect slice of pizza or an amazing wine is not going out of style in 2018. According to Rezdy, an app that works with tour providers, winery tours made the top ten of tour categories for 2017, and with the increasing importance of food culture, 2018 may be a banner year for those brewery crawls, restaurant tours and even dinner cruises. We’ve got non-profit fundraising auction travel packages to take advantage of each one of these trends. Reach out in the new year to find out how! In less than two months, the nation will watch as America’s top skiers compete at the 2018 Winter Olympics in South Korea. Every four years, the sport takes a prominent position not just in the sports landscape, but that of pop culture, as well; television ratings spike as year-round sports fans and novice viewers alike cheer on the United States through the television. Telluride, Colo.: This small mountain town may not get the attention of glitzier neighbors like Aspen and Vail, but its bucolic nature has its own charm. The gondola that takes visitors from the Mountain Village to the town itself is the only one of its kind in the country, for instance. But you’re hear for the skiing, and that is plentiful; Telluride Ski Resort has more than 2,000 acres of runs for amateurs and experienced skiers alike. 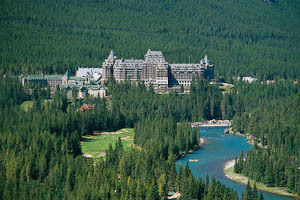 British Columbia, CA: Whistler might be best known as the home of many of the skiing events of the 2010 Winter Olympics, but hosting the games is not the only honor that’s been bestowed upon the resort. Whistler Blackcomb in consistently ranked as one of the top ski resorts in North America, and with our trip, you have ski-in, ski-out access. Lake Tahoe, Nev.: It would be hard for any skier to run out of powder in the Sierra Nevadas, thanks to multiple resorts within just miles of the front door. Last winter, Tahoe ski resorts got more than 500 inches of snow, meaning there was always a fresh layer upon which to ski. Stowe, Maine: The state is Maine, but at the Trapp Family Lodge, there’s more than a taste of Austria. It was the home where the real-life Trapp family settled in 1950, and after a fire thirty years later, the lodge was rebuilt into a 96-room stunner. Backcountry and cross-country skiing are the kings of winter activities, but there’s plenty of room for snowshoeing and hiking within its 2,500 acres. Almost half of Americans reported that they did not use all of their vacation days in 2016, according to a survey done by Project Time Off. Last year, that translated to more than 660 million days left unused. Even worse, 206 million of those days could not be “banked” or converted into money at the end of the year. Those hours were forfeited completely, meaning that the American workforce essentially “gave up” $66.4 billion worth of compensation. We’re biased, of course; our work here is to partner with non-profits to offer fundraising travel packages for auctions and raffles, and if your donors are staying in the office all year, that means fewer bidders. But there are plenty of other reasons to make sure that you encourage your donors to (and that you yourself!) take their vacations as seriously as they take their work. First, there’s the health benefits. They may be the most often-discussed positives to vacations, but they’re worth emphasizing: Getting away from work, even for a short period, decreases stress, decreases the risk of heart disease, and improve sleep patterns. That’s before factoring in mental health benefits, too. It’s not the proverbial apple that keeps the doctor away, but that feeling of wellness that often comes after a break isn’t all in your head. Vacation days can also be used as a point of contention during contract negotiations. The easiest way to make it appear that you need that extra week of vacation time is to have actually used your days off in the previous years. If you don’t, bosses may want to trim them back, under the idea that you’re not using them anyway. Ever get the best idea for solving a challenge at work while in the shower? Or at post-work happy hour? The rest and recharge of a vacation can often help you be more effective upon returning to the job, as well. A 2014 study says that “cognitive flexibility” increased in a sample of workers after returning from a break. That distance from the day-to-day grind, the emails and meetings of office life, can relax the mind and free it up to make associations and connections it might not make while stressed. Finally, human beings just need rest. Study after study shows that workers are more productive after returning from a vacation, especially one that is stress-free (like our turn-key trips). “"If people are overworked, they're surfing the Internet," author Christine Louise Hohlbaum tells CNN. "They're not contributing to the bottom line." If guilt of not helping the company is why your donors are trudging along in the office, point out that they might be doing more harm than good to the business. Somehow, beyond all reason, it’s already December, making 2018 just around the corner. With the end of the year comes a barrage of top 10 lists, awards, and other forms of rankings. We could never rank the non-profit fundraising travel auctions in our Destinations of Excellence catalog, but we do love awards. They make for easy selling points for an auctioneer, a bullet point on a lot listing, and one more reason for your donors to want to go from watching to bidder. We’ve picked out three different awards to give you a taste of what others are saying about these terrific destinations, while also hopefully giving you a chance to add another bullet point to the lists of each city’s charms. Charleston: This southern charmer is a big hit over at the offices of venerated travel magazine Travel and Leisure. The editors released their Worlds Best list of 15 cities earlier this year and not only was Charleston the only American destination in the top 10, but it finished second overall. It’s easy to see why: Between the great food, the beautiful downtown district and its temperate climate through the winter, the city has a lot going for it. Las Vegas: The World Travel Awards have been promoting the tops in the travel industry for more than 20 years, and while there are seemingly enough categories to recognize every city in North America, one name kept popping up. According to the awards, the leading tourist attraction in 2017 for the region was the Las Vegas Strip, while the city itself also won as the leading destination, as well. There’s a reason that the city saw more than 42 million visitors in 2016, a record high according to the Las Vegas Sun. Chicago: Not every travel-worthy award has to be directly tied to travel, of course. The James Beard Foundation recognizes the best bars, restaurants and chefs throughout the country each year. In 2017, Chicago’s Topolobampo took the crown with its Rick Bayless-led Mexican food (Sarah Grueneberg of Monteverde also took home the prize for Top Chef of the Great Lakes region). It’s not a fluke; Chicago is an underrated foodie paradise which deserves to be known for much more than pizza (though we love its pizza, too!). If you’ve got donors who are big fans of the newest and greatest restaurants, mentioning the Beard Awards is a sure-fire conversation starter. Your donors who bid on our non-profit fundraising auction travel packages at your gala event likely have a loose itinerary in their mind for their trip. Maybe it’s a soccer fan, going to Barcelona to experience a game in the world-famous Camp Nou, or maybe it’s a jazz aficionado looking forward to a night out on Frenchman Street in New Orleans. But it’s a rare traveler who has every moment of their vacations planned out. So to add to our trips, we’ve got tours. One of our favorite add-ons to any travel package is a local tour, one that allows a visitor to see all that for which a city is famous. Our Destinations of Excellence catalog is filled with expert-led expeditions into the heart of what makes a place special – and that often includes a meal, a drink or another memory-making, multi-sensory experience. Barcelona: Tapas are perfect tour food; you can have a small plate at each establishment, and not feel stuffed by the end of the walk. It’s why our “Ensconce Yourself in Spanish Exclusivity” package comes with a gourmet tapas tour, to tempt tastebuds – and it even ends with a flamenco show! Charleston: We’ve already told you why Charleston makes a great winter destination, but our packages to the South Carolina gem include a bonus: A horse-drawn carriage tour through the city’s downtown district, focusing on history and the charm of Charleston’s mansions and gardens. Chicago or New York: Deep dish or thin slice? Depending on your donors’ preferences, you can send them either on an Original Chicago Pizza Tour (with our “Leave a Pizza Your Heart in Chicago” package) or explore Greenwich Village on a pizza and beer tour. Fun idea: Have the crowd vote on which pizza is better by email before the event, then sell the corresponding trip! Champagne, France: We’ve got tours of wineries in many of the world’s top vino-producing locales, but this one may be the most specialized. If your donor’s favorite part of any gala is a champagne toast, this might be the trip that moves him or her to bid big, thanks to tours of three different wineries in the varietal’s titular region. Lexington, Kentucky: Your supporters can go behind the scenes at Churchill Downs, the home track of the Kentucky Derby, with a tour of an area horse farm. It’s a great way to catch up with the race’s history, while also perhaps seeing its future. New Orleans: Jazz and Sazeracs reign supreme in the Big Easy, but for a different sort of fun, take the ghost and spirits walking tour included in our “Along the Mighty and Mysterious Mississippi” package. Going through the French Quarter, the tour is a fascinating change of pace for visitors both new and frequent. Want more information on tours that come with our travel packages? Reach out to a consultant today! Giving Tuesday is (Almost) Here! In 2016, Blackbaud Institute for Philanthropic Impact processed more than $47 million in donations on Giving Tuesday. That’s a 20 percent increase from 2015. And the cut of that revenue going towards small and midsized organizations has increased year-over-year as well, meaning that more groups are getting involved in the unofficial charity holiday. If you’re not raising money on Giving Tuesday, you may be leaving money on the table. It might be a little late to launch a full-fledged campaign for the 2017 edition, which is November 28, but there are still some ways to be involved. First, and this should go without saying, reach out to donors. The holiday season gets busy, and even your most dedicated donors may not have your cause at the front of their minds. An event like this should be a part of your messaging leading up to the day. Just being open on Giving Tuesday won’t bring in anything. Be specific. Asking generally for money on a specific day can feel a little hollow; what makes Giving Tuesday different, then? But if you look to garner donations for a specific reason – think fund-a-needs at galas, for instance – you can focus your donor’s attention and let them know exactly where the money is heading. Be social. Every store on the planet seems to take out multiple advertisements for their Black Friday sales. Your cause is competing for eyeballs with that, and you don’t have the print budget to stuff a circular in every mailbox. So instead, reach out to influencers and supporters who are active on social media and see if they can boost your message through their networks. Throwing a gala auction to match up with Giving Tuesday might be difficult (although we fully approve of holiday-season events, as we’ve mentioned before). But that doesn’t mean that your supporters can’t also win. Holding a raffle with the drawing happening on Giving Tuesday (maybe even streamed on your Facebook site?) can help grow interest, and doesn’t take the work of a full auction. Finally, a big ask: This is a great date for which to try and get corporate matching funds. See if a major corporation would be willing to match donations dollar-for-dollar (even if it’s only to a certain limit). Knowing that their giving might be doubled can be a great motivator for supporters. No matter how you approach Giving Tuesday, we hope that you hit all your fundraising goals as we round into this busy holiday season! It’s the most wonderful time of the year, as the carol says. We’re heading straight into the holiday season, when families gather, kids (and adults!) tear the wrapping paper off presents, and we gorge on massive meals. But is it also a good time for your cause to throw a major gala fundraiser? Having been in the business of selling non-profit fundraising auction travel packages on consignment for more than 20 years, we’ve worked with events that have taken place at any point on the calendar. If you’re considering having yours during this busy period, we’ve got some reasons why it could be the most wonderful time of the year for your non-profit, too. Donors are in the mood to party! November and December are often filled with invites to dinner parties, after-work get-togethers and gift exchanges. It’s a time of year that welcomes large gatherings, and throwing your fundraiser during this time period can tap into that energy. Your fundraiser can even be a time for supporters to bring together family members or friends, all in the sake of raising money for your cause, like a party inside a party! December galas line up with year-end giving. A 2014 study showed that almost a full 20 percent of giving happens in the month of December, and more than a third of it happens in the year’s last three months. Getting to see your donors face-to-face during that time can help garner bigger contributions (and auction bids). And using that factoid can help convince donors to “do their part” during a December fundraiser; those donations can come alongside auction bids for one record-setting evening. Fundraising auction lots make great gifts. Items like non-profit fundraising auction travel packages are highly “gift-able.” You can capitalize on the season of giving by offering items that your big-budget donors would like to give to family members or friends, and they’ll appreciate the opportunity to finish their holiday shopping by supporting an important cause. And with our Destinations of Excellence catalog offering trips around the world and tickets to major events, you can make sure that your biggest supporters have the perfect travel package as a present. In the end, there’s no one prescription for when everyone should throw a gala fundraiser. But keeping in mind the pluses and pitfalls of the holiday season, and applying those thoughts directly to your audience of donors, can be the difference between a successful outing and one that raises less than the goal amount. And remember – there’s always spring, too! Off-season travel can be a great way to get more out of a vacation. The crowds are thinner, reservations are easier to obtain, and unless the main activity is seasonal (think skiing in Colorado), there’s just as much to do. One of our favorite off-season destinations is the American South, which technically is at its tourism low in the winter. But it can be hard to figure why; with moderate temperatures and the same great range of attractions, we think our non-profit fundraising auction travel packages only get better when utilized during the off-season. Hilton Head - Your donors already likely associate this South Carolina island with golf. If you’re in a colder winter climate, you can help them associate it with the word “escape” as well; the average high temperature by month here never falls out of the 60s, and with less rain in November and December than almost any other month of the year, golfers can get out on the course during the months that their clubs usually reside in deep storage. Of course, the islands restaurant scene never closes, so those not into the “gorgeous walk, spoiled” will enjoy their time here, as well. Charleston – January is the only month of the year during which the average high temperature of Charleston dips out of the 60s. With an average high pushing 90 degrees in the summer months, the city opens up in the winter; walking around and seeing the historic mansions doesn’t have to end with you drenched in sweat. And it’s also a perfect time to visit the Magnolia Plantation and Gardens – according to Conde Nast Traveler, there are up to 20,000 camellia blooms during this time in the oldest public garden in the United States. New Orleans – With an average high of 55 degrees, Crescent City can feel a little chilly in the winter, comparatively. However, the secret reason for heading to New Orleans during the winter is the precipitation; rain peaks in the summer here, and while October and November technically have the least number of rainy days, December and January (an average of 10 days of precipitation) are still much dryer than, say, July (15 days). Being able to stay dry – even if you have to wear a coat – makes the walkable streets and neighborhoods of New Orleans much easier to navigate. 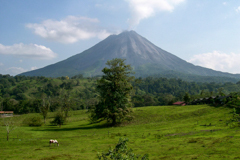 This is doubly so with our travel packages, many of which include walking tours or river cruises. November is here, and that means that the holiday season is at hand. AAA says that 103 million people were expected to travel during the year-end holiday season last year, and another 48 million were set for the road on Thanksgiving. Odds are good that you or someone you know will be braving the roads or the skies at some point over the next two months. Our non-profit fundraising travel auctions can be used throughout the year, but we’ve got a special place in our hearts for holiday travel. If you or your donors are thinking about getting on the road for the season, take these tips to heart to make sure and get the most out of your itinerary. Give Yourself Time: Going from the parking lot to the terminal. Getting through security. Everything seems to take just a little bit longer in the winter when it comes to travel. It might not make the kids happy, but giving yourself the full recommended two-hour buffer between arrival at the airport and takeoff can be the difference between catching and missing that flight. And if you’re driving anywhere, it’s needless to say that traffic can be a beast during the holiday season – build in some extra time. Enjoy the Airport: Mechanical delays? Weather warnings? A quick layover in an airport can turn into a protracted visit in a hurry. The good news is that airport planners have taken steps to make your stay tolerable, if not downright fun. In Portland, that means a movie theater showing short films. In San Francisco, the “Wag Brigade” is a fleet of animals – mostly dogs, with LiLou the pig thrown in – for some pet therapy. And at many airports, local breweries and restauranteurs have taken the place of the formerly-ubiquitous McDonald’s and Starbucks outlets. If you’re stuck somewhere, the least you can be is full at the same time. Watch the Weather: Are you driving? According to American Automobile Association, more than 93 million people traveled via automobile during the December holiday season in 2016. If you want to be one of that number, remember that the luxury of car travel is flexibility; you’re not tied in to leaving on a certain date. So when that winter storm rolls in on your planned departure day, there’s nothing wrong with waiting it out. You’ll be safer waiting until after the snowplows have hit the highway. Smile: This may be the toughest part. Travel can be extremely stressful and frustrating, especially with the complications that the holiday season brings. But keeping good humor about you will not only keep you sane, it can help your travels move faster; anyone who works in customer service will appreciate seeing a friendly face during a travel nightmare. Horror movies are based on bad decisions, like asking the wrong person for help after a car breakdown or running toward the haunted house. It’s these moments when the protagonist’s fate is often sealed. In a similar (if less graphic) manner, there are mistakes that an auction planner can make that seal a gala event’s fundraising fate, too. And while very few of them involve hockey-masked madmen or knife-gloved, wisecracking demons, they’re still worth avoiding in order to make sure that you raise as much money for your charitable cause as possible. Thinking Small – It can be a bit scary to offer a big-ticket item, like a week-long travel package or luxury goods. What happens if no one even bids the reserve price? But let your donors step up to the challenge; it’s better to ask for too much (especially if the item, like our non-profit fundraising auction travel packages, is being offered on no-risk consignment) than to ask for too little and possibly leave money out there. Saving the Biggest For Last – It superficially makes sense to save the highest-priced item for the last lot of the evening, letting the anticipation build to the very end. But think logically: If you’ve got two people bidding on the last item, one of them will lose. And that person will go home with money in his or her pocket that may otherwise have been destined for a different auction item. Don’t lead with the most expensive item of the day, of course, but don’t leave it until last, either. Getting a Volunteer to be Auctioneer – As well meaning as volunteers can be, a good auctioneer is worth his or her cost. There’s much more to running the show than talking fast and exclaiming “sold!,” and a professional auctioneer is skilled at getting the biggest bids out of an audience. Ignoring the Smaller Donors – Unless there was a lotto jackpot involved, it’s a good bet that your biggest donors started out as small-dollar supporters. Make sure that every bid or donation is recognized, and that those who might right now only be able to afford a smaller gift feel the love, too – it’s the right thing to do, and it could pay off in the future. Forgetting to Say Thank You – Your donors are happy to help your cause, of course, but it’s always nice to be recognized. Make sure that your supporters know how much their auction bids, contributions and presence means to you with thank you cards, follow-up phone calls and any other sort of recognition possible. There are some public transit systems so popular, you can buy their memorabilia. There are t-shirts available online with images of the New York City subway map and mugs with London’s famous “Mind the Gap” slogan emblazoned on the side. In fact, renting a car while traveling to either city – and being responsible for parking said car – can be incredibly inconvenient. Many of our non-profit fundraising auction travel packages come with bonuses like airport transfers. But when your donors are in the city, how do they want to get around? Do they want the hassle of driving, looking for gas stations and constantly worrying about parking, or would they rather let a good subway or bus system take care of the logistics? If your supporters lean toward the later, here are some of our favorite non-New York, non-London options. London may be the first European city that comes to mind when public transit is the topic, but don’t discount its neighbor across the Channel. Paris is home to the second-busiest subway in Europe, and has more than 300 stations. That sounds like it could be overwhelming for the outsider, but its density is a big benefit; there’s hardly an attraction in the city that isn’t accessible by train. Some of the older stations, which were built in the Art Deco and Beaux Arts style, are also architectural beauties on their own. Any city where the attractions are bunched together can be navigable via public transit, and there may be no better example of that than Las Vegas. With so many of Sin City’s activities situated on the Las Vegas Strip, it’s easy to use either the hop-on Strip bus “The Deuce” or take the monorail to jump from resort to resort. And with so many of the tours (like those to the Grand Canyon) taking off from Stripside spots, it’s like Mother Nature has her own bus stop. That same geographic centrality helps make San Francisco an excellent town to visit without a car. The trolleys are world famous, of course, but the Bay Area Rapid Transit system does the harder work for locals, connecting the City by the Bay to Oakland and Berkeley. Combined with local buses, the subway is enough for a visitor to see it all, without having to fight rush-hour traffic. There may be no city more closely associated with the automobile than Los Angeles, but the transit culture is changing there. Winners of our Los Angeles awards show packages can take the train almost directly to the front door of the Microsoft Theater in downtown L.A. – and during off hours, that same train can take your supporters to the beaches of Santa Monica, to the Hollywood Walk of Stars and even the Hollywood Bowl. It’s amazing to say, but it’s true: A visitor to Los Angeles can see most of the attractions and have a tremendous time without getting into a car. As seasons change, tastes change. The light fare of the summer months gives way to the rib-sticking comfort food of the fall. Vegetables come in and out of season – it’s time for pumpkins and squash. And vacation destinations often change, as well, as visitors flock to leaf-peeping areas or other places where the fall is colorful. We’ve written before about chasing the fall colors, so today we’d like to focus on how your donors can use our non-profit fundraising auction travel packages to chase the fall tastes. Far beyond a trip to the local coffee shop for a pumpkin spice latte, these vacation ideas can bring your supporters to where the vibrancy of the season can be both seen and tasted. When it comes to all things fall, the New England area tends to spring to mind directly. And at least two dishes that end up at meals across the world when the leaves change color have roots – some literally! – in the area. Pumpkin pie was technically invented in England, but their version is in no way similar to what we see on dessert tables at Thanksgiving; the modern pie could be said to get its start in the very first American cookbook, written in 1796 by Amelia Simmons in Connecticut. And the most popular variety of butternut squash, one of the fall’s most versatile side dishes, was developed in Massachusetts, just outside of Boston. Our northeast doesn’t have a monopoly on the season, however. We might think of “Here We Go a Wassailing” as a Christmas song, but did you know that “wassailing” has a second definition, tied to visiting orchards? In the West Country of England, cider is a major product, and ceremonies are performed there meant to give thanks for apple trees. Singing or not, the end product is fantastic apple cider, to be enjoyed either on its own or with a “spike” from an adult beverage. The fall is also a great time to break out those comfort foods, and there are few foods more comfortable than Irish stew. The dish goes back to the pre-potato famine days, using leftovers and cheaper bits of meat to make a meal out of scraps. That tradition has continued around the globe, as the Irish diaspora has spread; no two recipes for Irish stew seem to be the same, as locals use whatever is on hand to fill out the bowl. But if it’s got root vegetables and lamb or beef, it probably originated on the Emerald Isle. We think of fall as the time for pumpkin spice, football and the changing colors of foliage. But at travel agencies, hotel front desks and even some restaurant maître d’ stations, the season has a different name: Shoulder Season. Our non-profit fundraising auction travel packages can be used throughout the year, of course, but we’ve got a special place in our heart for that time when the biggest mass of tourists has gone home, the weather is still good and destinations are still at their most welcoming. The shoulder season, for certain travelers, can be the best time of year in some cities. “Shoulder season” is the name given to time periods that fall in between peak and off-peak seasons at tourist destinations. For instance, Montreal is glorious in the summer, but considered by many to be a bit too cold for winter travel. The fall, in between the beautiful summer and tougher winter, is considered the shoulder season there, along with April and May. Booking trips during this season, which can vary slightly based on destination but often comes in the fall and/or spring, can be a great way to get the most out of a vacation. Attractions are often less crowded, meaning more room to spread out on the beach or less time waiting in lines at Disneyland. Restaurant reservations can be easier to score, as well. And some destinations have shoulder seasons that come with unique attractions, as well; hiking in the Rocky Mountains can be rough during the winter, but fall walks through color-changing aspen trees in Telluride are stunning. There are some minimal risks to shoulder season travel, especially when it comes to the weather. Between late-season heatwaves and early-season storms, the climate can be unpredictable. Before the winter snowbirds arrive on Miami’s beaches in January, the region is prone to spurts of severe weather, for instance – even if the shoulder season here lies technically outside of hurricane season. Spring comes to life in most places at slightly different times each year; a trip too far north in April may mean dealing with snow. And shoulder season can fall during an inconvenient time of the year for some; for most destinations, it’s in the fall or the spring, making it a tough time for families to take kids out of school for a road trip. But if your donors are willing to take a small risk in terms of weather, they can often find destinations that are easier to navigate and have just as many attractions during the shoulder season as during the peak season. Some of our favorite add-ons to our non-profit fundraising auction travel packages are related to food. Donors love it when their trips include some of the day-to-day costs factored in (it’s why “all inclusive” packages often do so well), so having meals as a part of the package can be a strong selling point. What transforms included meals from a nice addition to a full-on attraction, however, is the caliber of the restaurants with which we work. Our travel packages include gift certificates to some of the world’s best restaurants, the types of places with chefs that donors are willing to bid high to visit. Commander’s Palace: The restaurant that gave Emeril Lagasse an early gig is a New Orleans institution, with its Creole menu and extensive wine list, still attracts diners from around the world, more than 120 years after its opening. It’s a member of the Culinary Institute Hall of Fame and has won several awards from the James Beard Foundation over the decades. The Biltmore Dining Room: Much of the menu at the Dining Room comes from Asheville’s Biltmore estate; greens, beef, lamb and various berries often come from the grounds. The rest of the menu is sourced as close to Asheville as possible, making it one of the freshest farm-to-table experiences available. Esquina Bar and Restaurant: Called Medano Beach’s “best new restaurant” by Fodor’s, this Cabo San Lucas stunner makes full use of its seaside location to offer scallops, shrimp, and a catch of the day. The subtle Mediterranean touches on the menu (chicken kebabs, hummus, etc.) and the lunchtime takes on pizza make it an eatery for everyone in your donor’s party. When the fall arrives, it brings with it any number of changes. Kids go back to school. Football Sundays become mini-holidays for the sports addict. And t-shirts give way to light jackets and sweaters in closets everywhere. But for the traveler, fall often means one change more important than any other: The changing colors of the trees everywhere that the temperature is moving. If you’ve got donors who are looking to get away with one of our non-profit fundraising auction travel packages, this is one of the best times of year for them to hit the road. And if they want to maximize the visual benefits of the season, these destinations should be under serious consideration. Boothbay Harbor – The fall colors are so inspiring in Maine that Boothbay Harbor hosts its own celebration. The Fall Foliage Festival is in its 50th year in 2017, celebrating the season with crafts, contests and even steam-powered train rides. It’s northern latitude also means that the ideal window for seeing the leaves change is a little later than it is for most other locales; a visit here in mid-October can cap a full season of gorgeous color. Telluride – This mountain hideaway is a stunner year-round, but it’s the fall when the area’s aspen trees start to turn. Grove after grove of the thin trees start to go yellow and orange, and so many of the area’s hiking routes become an explosion of color. The city’s tourism board even has their own name for it: Gold Season. See the color from Telluride’s gondola, lakeside at Woods Lake or on the back of a mountain bike on one of the area’s trails. Sedona – The desert of Arizona may not spring right to mind when considering fall foliage, but this oasis explodes with color in the autumn. The road between Sedona and Flagstaff has been called “the closest thing Arizona has to a New England display of fall foliage” by the Arizona Republic, and with a later-than-average window for the changing leaves (sometimes extending all the way to early November), it’s a great choice for those who might be tired of the expected fall getaways. Montreal – Americans aren’t the only ones obsessed with all things fall, of course. Whether it’s parks within the city itself or quick jaunts into the surrounding county, Montreal makes its case as a tremendous fall autumn destination thanks to the neighboring Laurentian mountains and various ski resorts. And with the change happening usually around the end of September, the temperature is still warm enough for light jackets, rather than parkas. We’ve mentioned before – a few times – our love of traveling for the sake of the palate. Getting gumbo in New Orleans, going on a deli tour of New York, taking a cooking class in an Italian villa: Travel and food makes for a perfect pairing. Many of our destinations are closely associated with a certain cuisine, be it Creole in New Orleans or all the different variations of pasta on offer in Italy. But some of these locales are also linked to famous chefs, some who stick to one specialty and others who offer variations on foods from around the world. If you’d like to offer your donors a chance to visit the home restaurant of one of their favorite chefs with one of our non-profit fundraising auction travel packages, we’ve got plenty of options. Emeril Lagasse: BAM! The chef, television star and spokesperson is worldwide, of course, but New Orleans is certainly his spiritual home. He gained much of his fame heading up the kitchen at Commander’s Palace, a Crescent City institution (and, we’d note, a dining option on our “Discover New Orleans’ Celebrated Downtown” package), and now has four restaurants in New Orleans. Roy Choi: Not all great chefs work in white tablecloth joints. Choi is the first star of the food truck era in Los Angeles; his Kogi trucks combine Korean and Mexican cuisine into an addictive mix, one that helped launch Choi to stardom. Now, his menus and ideas can be found at six different restaurants in the L.A. area. Jose Andres: The Spanish-American small-plate chef owns restaurants across the country, but it is Washington, D.C. where he may shine the brightest; his minibar by Jose Andres seats just six diners at a time, only operates on a prix fixe basis and is a Michelin star winner. He’s also earned plaudits for bringing high-end food to moderate budgets at outlets like Jaleo and China Chilcano. Alain Ducasse: To be known as one of the great chefs of Paris is to be called an all-star of all-stars; any sort of recognition in one of the fine dining capitals of the world is special. For Ducasse, that recognition comes from a staggering 15 restaurants in France alone, including El Jules Verne, located on the second floor of the Eiffel Tower. Seemingly Everyone Else: Don’t look now, but Las Vegas might have the highest concentration of restaurants from famous chefs in the world. Want to be yelled at by Gordon Ramsay? You’ve got five choices. How about Giada De Laurentiis’ first-ever restaurant? And Lagasse, Andres and Ducasse each have options here, too, meaning that “gluttony” is moving right up the sin rankings in Sin City. There may be no better time to indulge a sweet tooth than while on vacation. And, like cuisines or certain cocktails or wines, where you are may decide with what you finish your meal. At Mitch-Stuart, we love sending your donors to cities with great food, via our non-profit fundraising auction travel packages. While many foodies travel to celebrate their favorite meal, dessert can also be a compelling reason to hit the road. The line outside of Café du Monde in New Orleans rarely abates, and it’s with good reason. The coffee’s fine, the menu is pretty good, but the main event here is the beignet, a French-style doughnut sprinkled with powdered sugar. Paired with a cup of java, the beignet is the city’s unofficial breakfast, and while others bake them, du Monde’s is still considered the gold standard. The lineage of cheesecake can be traced all the way back to 14th century England. But the New York version is worth celebrating as its own creation; with a slightly-browned and smooth top, it is distinctive enough to be in its own category. Finding the best in the city is as tough as picking a best pizza slice; Junior’s in Brooklyn may be the most famous, but there are plenty of contenders for top prize. Any great French meal – and there are lots of great French meals, of course – isn’t complete until the after-dinner macaron. While they’ve taken off in America as well, Paris still leads the league; there’s even a version sold in France’s McCafe’s (the coffee shop version of McDonald’s). Find a Laduree bakery, which is said to sell 15,000 macarons per day, for a quintessential French experience. Invented in Italy in the 1960s, tiramisu is as omnipresent on menus at Italian restaurants as is pasta. With its coffee flavor and sweet finish, the custard pairs perfectly with a post-meal espresso or amaro as a way of lingering at a dinner table that’s lively with conversation. Pompi in Rome can often feature lines out the door for the dessert. Travel to Key West at the right time of year, and you can take part in a whole celebration dedicated to a particular dessert. The Key Lime Festival gives thanks for the local specialty, Key lime pie, with a pie hop (a bar crawl, but with pie), an eating contest and a “pie drop,” where people try to figure out how to drop one of the sweet, tart pies from the top of the Key West lighthouse and have it land without breaking apart. What makes a great resort? It’s a question we ask ourselves every time we create a new non-profit fundraising auction travel package, making sure that the accommodations are up to the level of the great destinations in our catalog. As we do that, we’re looking at qualities like the size of the rooms, the level of the cuisine available at the hotel’s restaurant, and even family-centric attributes like nurseries or play rooms. One of our favorite amenities at our resorts is the pool. Spending a long afternoon on a pool chair reading, splashing around in the shallow end with the kids, even getting in a swim – all ways of enjoying a vacation day. We flipped through our catalog to look at some (just some!) of our favorite pools at some of our top-of-the-line resorts. Which kind of pool suits your donors? As strange as it is to say, one of our favorite pool views involves the ocean. It’s the vista seen from the water at Jepun Bali Villas on the island of Bali. From the edge of the infinity-style pool, soakers can see down to the beach, with all the greenery between. And with the gorgeous blue tint of the water at Bali, that aqua and green contrast acts as a visual feast. The cabana-lined pools of the Encore in Las Vegas are exactly what one would expect from a luxury resort; surrounded by flower gardens and with optional food and beverage service available waterside, the pool feels like an oasis from the hustle and racket of the Las Vegas Strip. And like the city itself, there is no off-season, as the heated pools remain open year-round. One of our other favorite amenities that a resort can provide is a top-notch spa, and at the Fairmont Scottsdale Princess, they’ve combined their spa with poolside living. The rooftop pool is a favorite for those partaking in the spa’s health-conscious lunch options, and the view from their Willow Stream Spa Terrace is as beautiful as any beachside vista. Not every favorite pool is at a hotel, though, and not every pool is on land. Some of the best pools in our collection are aboard cruise ships. Used both for relaxing and for fun ship-wide events, there are often different ships for every group, including an adults-only pool for those looking to avoid the little ones. Best of all, savvy cruisegoers often say that poolside is the hub of activity on a ship; those looking to make new friends or find out about the best upcoming excursions would do well to hang out on a deck chair. When the calendar reaches late August, the minds of many – including some of your donors? – turns toward the school year. And the school year, of course, means rehearsals, practices, games, study groups, tutoring, lessons, and afternoons of frazzled parents driving their kids from activity to activity. Just looking at that list may make some of your donors want a vacation. However, it can be tough for a family to pack up and travel around the world during the school year. Some can plan vacations around holidays and breaks, but for most, a long weekend is the best chance to get out and see the world. Thankfully, you can help them with that with one of our weekend-length travel packages. Thinking about getting those families with school-age kids involved in your fundraising auction? Here are some factors to consider. Keep Them Close: We love encouraging your donors to see the ends of the earth when it comes to travel; it’s why we love destinations like Bali and Iceland, for instance. But there’s little reason to get on a plane and fly all the way to Southeast Asia, only to stay for three days and then come home! If you’ve got donors looking for a three-day getaway, don’t get caught up in sending them far away. Let them stay close to home, and they’ll have more time to relax or see the sights, rather than navigate airports. Emphasize Experiences: We love loading up our non-profit fundraising travel packages with fun experiences, like winery tours, cooking classes and even dinner cruises. It’s difficult to get the full experience of a city like, say, New York, or Los Angeles, in one weekend. However, in three days, one can get a pretty good experience of culinary New York, or beachside L.A., for instance. It’s why trips like our “Nosh Your Way Through Three New York Delis” are so popular; it allows your donors to focus on one element of what otherwise can be an overwhelming metropolis. Consider the Staycation: Not every relaxing trip needs to even leave the state limits. Most New York residents don’t get to go to Fashion Week runway shows, and most Angelinos don’t attend the ESPYs. And even fewer residents of any city get to stay at a local luxury resort. Whether it’s hard-to-get tickets, spa indulgences or golfing rounds, there are elements of our weekend-long trips that will appeal to locals as much as tourists, and the only travel needed may be a crosstown drive. For us, travel and food are a great match; many of the trips in our Destinations of Excellence catalog involve tasting tours of a city, spectacular dining experiences or even cooking lessons in different cuisines. That’s why we’re excited to be sponsoring the first season of OC Chef Life’s “Battle of the Chefs,” which holds its second “preliminary round” contest tonight in Anaheim. The show, being taped for online broadcast, pits two area chefs in a battle. They’ll be given a cuisine style (as broad as “street food” or as specific as “paella”) and put together small plates inspired by said style. Then, the audience will pick who moves on to the next round. Tonight, the showdown involves two of the area’s favorite chefs. Chef Pascal Olhats is a French and French-trained chef and restaurateur who has received the Wine Spectator Award of Excellence. His eponymous restaurant is a local favorite for fans of French cuisine. On the other side: Linda Johnson the owner and chef of Filomena’s in Costa Mesa, a restaurant often seen on lists of the top Italian restaurants in Orange County. If the talent isn’t enough to get you in the door, the view might be. The tournament takes place each month at The Fifth, the only rooftop restaurant and bar in Anaheim. With its unparalleled view of the Disneyland Resort (and its evening fireworks show), any event here is a special one – and add in the chance to sample the work of top-notch chefs, and you’ve got a tremendous night out. Finally, a portion of the proceeds each month go to charity, which is always a big plus in our book. Tonight, money will go to the Orange County Family Justice Center, an excellent organization that provides services to survivors of domestic violence, child abuse, sexual assault and elder abuse. Raising funds, eating great food and watching fireworks, from a gorgeous rooftop bar? We’re ready. If you wish to join us, click here to buy tickets. We’ve all received the email from a mailing list, with a come-on for a sale or other event. And we’ve all hit delete before we even know the product or service, based on a salutation like “Dear Sir or Madam.” Even in the age of programs that can merge donor names into email solicitations, there’s something about a mailing list that can feel cold. The best way to raise money with our non-profit fundraising auction travel packages is, of course, by selling them in a room of relaxed, happy donors. But in order to fill that room, you’ve got to reach out to them – and in doing so, it’s been shown time and again that personal entreaties are the best. One effective way of reaching out to your supporters is one of the most old-fashioned: The United States Postal Service. Yes, mass mailing isn’t always an efficient use of money, but targeting specific donors or supporter pools with a tangible invitation is still personal enough to get noticed. Better yet, turn the invites into discussion pieces; tie them to your theme, work with a graphic designer and make them sing, as if they were wedding invitations. Those are the types of postcards or mailers that get tacked to bulletin boards, affixed to refrigerators and, eventually, accepted. Social media advertising isn’t just for work-from-home schemes. With 68 percent of American adults using Facebook and 30 percent of all American adults of incomes more than $75,000 using Twitter, according to Pew Research, there’s a good chance that your supporters – and supporters-to-be – exist somewhere in the digital space. The audience for your advertisement can be selected by age, location and interests, meaning that your post promoting your event or gala can be in front of a huge number of potential attendees, right next to status updates or tweets from their friends. At Mitch-Stuart, we maintain that our non-profit fundraising auction travel packages are good for donors in all walks of life. We’ve got adventure travel, bucket-list trips and tickets to some of the biggest events in the world. But not every class of supporter always feels like they can get away. For donors who have young children, the thought of travel conjures nightmares of packing everything up in the car or, even worse, getting the kids to behave on a flight. The good news: We can help there. Because while there’s little that can be done to make getting to the destination much easier, making sure that there’s a spacious, private villa waiting may be enough inspiration to get those supporters interested in participating in your fundraising auction. Why do villas work best when traveling with young children? It’s all about space. Space for the Kid: Sleeping in a hotel room with an infant can be a test of even Zen-like patience. Having multiple bedrooms, like most villas do, gives the kids their own space, one where they can spread out their toys and play without interrupting the peace and quiet of the adults. It also means that, after the young ones go to bed, the parents don’t have to hold their voices to whispers in fear of waking their progeny. Space for the Family: We’ve said before that multi-generational travel is one of our favorite uses for our travel packages that include a villa as the residence. Having the grandparents along may help mom and dad sneak out for a nice dinner in a new location on their own. It certainly will make the occasion seem more like time away than being with the same people, just in a different room. And staying in a beautiful villa is a wonderful way to get family members acquainted with the newest generation. Space in the Kitchen: Ordering your small children the escargot is a perfect way to force yourself into a fast-food stop on the way back to the hotel. But with a kitchen, included in most villas, parents can prepare meals of which even the pickiest of young eaters will approve, meaning that a hungry child is never more than a room (or a prepared backpack) away from food that will remind him or her of home. It can help settle even the fussiest traveler to have that quesadilla, mac and cheese or even chilled yogurt. And as any parent who has traveled with a toddler before knows, “settled” sometimes is the best attribute that young explorers can possess. We all know the importance of saying “thank you.” After learning to not eat things off the ground and not touch a hot stove, it’s one of the first, basic lessons we learn as children. And in the non-profit fundraising world, we know that saying thank you to donors is important, as well; it gives them the chance to form a bond with an organization or cause, hopefully insuring that the supporters will help when called upon. But donors can sometimes be a wider category than we think. Yes, those who respond to mail solicitations or buy gala tickets and bid on auction items fall into that classification, but to limit the term to just them leaves out many supporters, including some that you’d be hard-pressed to get along without. Those Who Donate Items: Not all donations to your cause come in monetary form. Whether it’s business owners passing on a few of their wares or collectible items from a personal collection, getting auction lots donated to your cause can be worth their weight in bids. And since you’re going to turn those auction items into money anyway, it’s important to make sure that donors are recognized accordingly. Thank you notes after the auction are great, but also think about other options in conjunction, like a mention of gratitude when the lot is introduced at the auction itself, or a “donated by…” in the program. Underwriters: We spent some time in this space going over the benefits of encouraging major donors to “underwrite” certain trips. This can be a major commitment, of course, and so it’s important to recognize those contributors in any way possible. Like a donated item, they’ve made this travel package available, in their own way, so a mention during the auction, a thank you after the gala, and a program shout-out are all appropriate. It might also be nice to pass along any notes, thank yous or photos that you receive from the item winner after he or she returns from traveling – a way of including the underwriter later and an excuse for a reminder that the next gala auction event is always around the corner. Volunteers: It’s difficult to pull off a major auction event with just your paid staff, which is why most galas depend on a team of volunteers. You may not be able to pay them, but you can make sure that they feel important. Giving them recognition from the stage and sending thank you notes are, again, both important. But trying to find other ways to put them in the spotlight can be fun, too; maybe a volunteer helps introduce one of the night’s biggest auction items, or gets on the microphone to give some background on the cause for which your organization is raising money. Letting your volunteers take center stage give them one more reason to feel warm and fuzzy about your non-profit, which will help when you call for their unpaid assistance in the future. Travel with a … Grill? But to limit barbecue, the unofficial foodstuff of summer, to a binary choice is to ignore grilling traditions from not only all over the country, but all over the world. Mitch-Stuart has non-profit fundraising auction travel packages to use for any number of reasons, and many of them have culinary twists, whether it’s food tours or in-residence cooking lessons. If you’ve got donors who are connected at the hip to their grills, the type who like to look over the shoulder of the chef at every cookout, some of these alternative barbecue destinations may garner big bids at an auction. Anyone who has seen Hawaii portrayed on television is likely familiar with the luau, where the party often barbecues a full pig. But that’s not the only way that Hawaiians prepare meat over an open flame. When on the island of Oahu, ask around for a good purveyor of huli-huli, which is chicken done rotisserie-style and, as one might expect, seasoned with a pineapple-forward marinade. While a full luau can be hard to find (and costly to attend), huli-huli is sometimes found even at stands or food trucks. Really good ‘cue is likely a little too heavy for the health-conscious residents of Los Angeles. But head up the coast a couple of hours – closer to Santa Barbara – and you hit Santa Maria, the home of tri-tip barbecue. A Santa Maria-style plate of barbecue is likely to closely resemble a steak as served in a restaurant; seasoning is sparse, and the taste of the meat (and the smoke created by the oak-powered fire) is the star. The supporting cast, though, can steal the show; most Santa Maria-style barbecue joints will serve it alongside grilled French bread that’s been decadently dipped in butter. And America does not have a monopoly on great grilling, of course. In Barcelona, the art of barbacoa involves a heavier emphasis on pork over cow or chicken, but it still tastes delicious all the same. And barbacoa in Barcelona is often done in a very communal atmosphere; festivals are prevalent, maybe as common as private, backyard affairs. And in Tuscany, like Santa Maria, there’s no sauce used (except for a finishing drizzle of olive oil), but the flavor that comes from the all-wood fire is plenty for most barbecue fans. With an emphasis on fresh elements (especially vegetables), European grilling is both healthy and flavorful. There may be no more quintessential summer vacation than one involving a beach. Ever since automobiles have existed, Americans have jumped in the car to take day trips out to the shore. And there are several trips in the Mitch-Stuart catalog set up for your sand-loving donors. But to limit major bodies of water to objects of stares from seaside recliners is to ignore several different ways in which water can be the centerpoint of a fantastic vacation. Do you have any water-loving donors? If so, we’ve got a non-profit fundraising auction travel package that lets them interact with oceans, rivers and seas in almost any manner. In the Water: For those supporters who want to do more than stare at an ocean, three of our trips to Bali might fit the bill. SCUBA lessons are easy ways for your donors, even the inexperienced ones, to interact with underwater nature, and in the pristine waters around Amed, the fishing villages on the eastern side of the island, there’s plenty to see beneath the sea. Maybe they’ll even spot the sunfish, Bali’s 2,000-kilogram docile monster of a fish, for a great photo opportunity. On the Water: We love cruises here at Mitch-Stuart – we just took this space last week to talk about best practices for your donors who are heading out on the seas. But if you’ve got supporters who want to stick to one destination but still get in some boat time, offer one of packages with sightseeing or dinner cruises. Be it gliding through Amsterdam’s canals at night, exploring the architecture of Chicago, or experiencing some of the best jazz that New Orleans has to offer (along with a Creole buffet! ), the options for day-long or shorter cruises on our trips seem endless. By the Water: Of course, just being ocean-adjacent is good enough for many people. Mitch-Stuart has dozens of non-profit fundraising auction travel packages that will put your donors on a beach chair overlooking some body of water. But another way to stay by the water is to find a great stream and go fishing. Our “Freshwater Fishing in Gorgeous Canada” package sends supporters to Alberta or British Columbia for a fly fishing expedition. With the reasonable Canadian temperatures (the average high in Whistler is 80 degrees during July, the city’s hottest month) and the fun of learning how to fish from experts, the travel package is the type that will have certain donors jumping out of their seats during an auction. At Mitch-Stuart, some of our most popular non-profit fundraising auction travel packages involve cruises. We love being able to send donors on an all-inclusive trip that touches on several different countries and offers opportunities for a tremendous range of activities. And since we’ve been fans of cruises for so long, we know some great ways for a donor to take advantage of time out at sea. If your donors follow these four suggestions, they’ll make numerous new memories – and they’ll remember that your non-profit helped make them happen! Pace Yourself: Whether it’s food, drink, or sun, it’s easy to be a bit too gluttonous on day one of a cruise. And as big as a modern cruise ship is, there’s way too much to see at once. Relax, make reservations for activities at a later date, and try to soak in a bit of the ocean before trying to do it all. Get Off the Ship: It can be hard to remember, with all of the food, the activities and the amenities aboard a cruise liner, that the ship itself is only part of the destination. Whether it’s a warm-weather cruise around the Caribbean or an adventure into the waters of Alaska, these trips explore some of the world’s most beloved territory. And with adventures ranging from guided tours to adrenaline rushes, there’s something off the ship – just like there’s something on the ship – for everybody. Expand Your Palate: The variety of dining options on modern cruise lines, especially the ones in our trip catalog, is breathtaking. If your donors want to make sure they enjoy their journey, they should eat more than the same five dishes that make up their diet at home. Try sushi, or Chinese hot pot cuisine. Go to that Tuscan Italian steakhouse. It’s a rare opportunity to have so many options at just an arm’s length; tell your donors to take advantage (and to send pictures of the exquisite meals back, of course!). Don’t Wait: Want to try out one of the specialty restaurants? How about getting a massage? Your donors need to approach the trip with an outline of what they want to do while at sea, and make sure to reserve their spots as soon as possible. That great off-ship hike or fantastic chef’s table dinner is not hidden, and there are hundreds of other passengers likely interested. If they commit early, then they can relax and enjoy their voyage without the fear of missing out. For some, July 4th means grilling in the back yard, getting together with family and friends, and watching the big celebrations in Washington D.C. and elsewhere on television. But at Mitch-Stuart, we think that the Fourth of July is one of the best holidays of the year for themed travel. A federal holiday, in the summer with kids out of school? It’s no wonder that AAA rates July 4th as one of the largest travel holidays of the year; more people often hit the road in early July than do for Memorial Day! We’re big proponents of traveling for a specific reason, whether it’s a tremendous wine tour in Italy or a Broadway show in New York. And while many of these Fourth of July celebrations are travel-worthy on their own, some are add-ons to already-fantastic events. Consider it a two-for-one Independence Day Sale: Your donors can go to an event and get a party at the same time. For those looking to combine a patriotic display with an attraction in one of our favorite destinations, these celebrations are ones to watch. There are fireworks displays in and around Los Angeles too numerous to count. A favorite for decades, though, has been the July 4th show at the Hollywood Bowl. Often headlined by a legendary music act (Smokey Robinson played the 2016 edition) and always with a patriotic medley performed by the Hollywood Bowl Orchestra, it’s a quintessential summer evening in L.A. Pair it with a pre-show picnic (outside food and drink are allowed at the Bowl), and a donor will have a unique story to tell about a trip to the City of Angels. The biggest Fourth of July celebration in some destinations is tied to a local sports team. In San Francisco and Atlanta, for instance, fireworks follow the baseball games of the Giants and Braves, respectively. Cities with minor league baseball squads often light the skies over their stadiums, as well. The best-kept secret, though, may be in Denver, where Major League Soccer’s Colorado Rapids throw an all-day affair, called 4th Fest. Since the team’s inception, it’s been the one of, if not the, biggest celebration in the state’s capital city. Of course, considering the historical import of the day, it is not surprising that museums often do a great job of celebrating July 4th. In cities like Boston (at the Museum of Science), San Diego (USS Midway and Maritime Museums), and Chicago (Chicago History Museum) revelers can spend the day splitting time between picnics and exhibits. 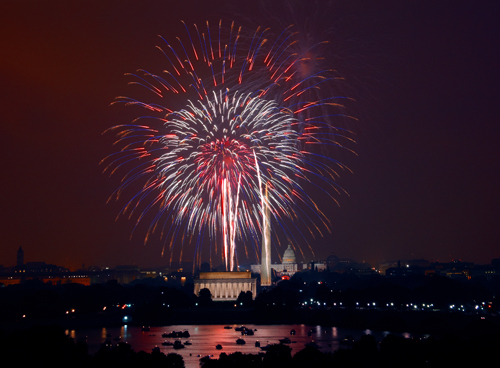 And of course, the biggest museum-adjacent celebration is also the nation’s most famous, as the National Mall (which is lined with different Smithsonian museums) welcomes as many as a million people for a concert and fireworks show. When it is blazing hot outside, few people want a hearty meal. The summer is the time for lighter cuisine, with dishes that match the seasonal availability of many fruits and vegetables – and often don’t require adding to the home’s heat problems by turning on the oven. Mitch-Stuart loves to send donors on foodie adventures with its non-profit fundraising auction travel packages. During the summer, those trips are less about rib-sticking soul food or heavy cream-based sauces and recipes, and more about light dishes, the type that don’t weigh a diner down afterward and can be eaten in between hikes, bike rides or even surfing runs. If you’ve got some supporters who think the way to a good vacation is through the stomach, we’ve got destinations to which they’d like to go during the summer months. When it comes to lighter summer fare, no city may spring to mind faster than Los Angeles. The City of Angels eats lean throughout the year, and there’s an abundance of options; some of the country’s best sushi restaurants are here (five of the top 20, according to an MSN list released in late 2016), and seafood is fresh and abundant. In addition, health-conscious Angelinos take some of the lightest options from elsewhere and make them their own, as evident in the town’s current poke fever. More than a continent away, Italian food is often stereotyped as being heavy, thanks to rich sauces and plates full of pasta. But in the southern part of the state, especially along the coasts, seafood reigns. A city like Sorrento is as well known for its clams as its spaghetti – in fact, the combination of the two is one of the town’s most popular dishes. And almost every meal here for those of age ends with a digestif of limoncello; it’s such a tradition, some restaurants offer a pour of it free of charge when diners ask for the bill. Lighter cuisine can also describe the portions, too. Take Barcelona, where its traditional foods like gazpacho and paella are served as tapas, or small plates. Not only does this mean no entrée-sized calorie bombs, but also it allows for diners to sample a wider range of dishes. Dinner at a restaurant in Barcelona often means being able to sample, snack on and share the entire menu, rather than making just one choice. Considering that options will often range from pa amb tomaquet (tomato bread) to Iberian ham, even the heartiest diners may want to downsize their dishes. You know about using an auctioneer, you know about planning for outdoor venues, and you know where to spend money to make sure your event is as successful as possible. Along with providing once-in-a-lifetime fundraising auction travel packages to sell on consignment, we love to help out with any advice you may need when it comes to arranging a fundraising gala. Many of the more basic tips are either common sense or discussed elsewhere on the blog. So this week, let’s look at some other ways to make your next fundraising auction the best one yet. We often talk about diversifying auction items; a lot list with nothing but golf items may not appeal to the widest range of gala attendees. But by offering different kinds of trips during your event, you can reach every type of bidder, too, whether it’s the supporter who likes the thrill of a competitive back-and-forth or someone who just wants to buy an item to help, rather than deal with an escalating price. Offering live and silent auctions, along with “buy it now” items and even raffles, means offering your donors more chances to get involved. Every bid is a data point for the planning of future auctions. If you see someone going big, whether winning or losing, you want to know their interests and what they might be seeking. These are the people to which you want to reach out before the next event, to see what has caught their eye lately. Then, figure out how to deliver that item. It will take some of the guesswork out of the process of rounding up auction items and guarantee that every item has someone in the crowd for which it’s the pinnacle of the evening. Sometimes, items are stronger together. If you’ve got some donated lots that may not be big enough to deserve their own time in the auction spotlight, find a creative theme and turn three or more small pieces into one big gift basket. It gives you more time during the auction to spend on each lot, and it takes focus away from the individual items. Instead, your donors will have the chance to support your cause by buying a “basket” of items, at least one of which a supporter may be interested in. In fact, if you’ve got donors interested in different parts of the collection, you’ve just increased the competition for all of them. Want more auction tips? We’ve got them! Reach out to one of our Travel Experts for more information. As May turns into June, Memorial Day fades in the rear view mirror, and the summer solstice sneaks up on us, thoughts often turn to vacation. Kids are out of school, workplaces may be a little more lenient when it comes to three-day weekends, and something about the warmer temperatures tells us that it’s time to get outside. Often, as we pull out our calendars, we think of area beaches – or even of flying to nicer ones. But there’s another way to think about the summer traveling season: What are the destinations that are, by far, best in the summer? Where should you go in June, July and August where there’s a major advantage over November, December and January? While it’s true that modern cruise ships are pretty well climate-controlled, summer is still the best season by far to take a trip through Alaska. The “cruise season” is said to run from April through to September, making summer the most popular time, and with good reason: High temperatures are warm enough that off-boat excursions don’t require coats. Late summer, in particular may be particularly attractive, with nighttime growing dark enough to catch glimpses of the northern lights and the mosquito population beginning to thin out. Average high temperatures in Reykjavik, Iceland never get above 60 degrees, even during the summer, so it’s not the place for the thin-blooded. But considering that the average high temperature in the winter months hovers around freezing and summer precipitation averages are as much as 40 percent lower, anyone looking at heading to the Icelandic capital would do well to consider June, July and August. An added bonus: At the summer solstice, the city gets as many as 21 hours of sunlight, meaning even more time for exploring the country’s rugged beauty. The southern hemisphere is in the midst of winter when we’re enjoying beach weather here in the north. The temperatures in Bali, though, do not deviate much throughout the year, thanks to the island’s proximity to the equator. Accordingly, the seasons are separated less by degrees and more by inches of precipitation. The winter, according to the travel experts at Frommer’s, is considered the rainy months, where flash floods and afternoon thunderstorms are frequent. If your donors would like to explore Bali’s charms without getting soaked (or carrying around an umbrella), our summer is by far the best time to visit. It’s thought that the first boardwalk in the United States opened to the public in the late 19th century, in Atlantic City. The idea of combining entertainment of one form or another with beautiful beach views may have existed previously, but it was there, in New Jersey, where an American summer totem was born. Mitch-Stuart loves setting up donors with summer vacations worthy of postcards and “How I Spent My Summer” papers upon return to school. Our non-profit fundraising auction travel packages can send your supporters around the world, and during the summer some of our favorite destinations have amazing boardwalks to explore. 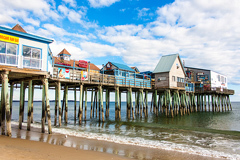 For families, Old Orchard Beach checks off all of the requirements of a great boardwalk. There’s the Palace Playland, with its carousel, slide and bounce house for the kids. For adults, the pier has its own nightclub. And for everyone, the restaurants serve some of the freshest seafood around including Maine lobsters (which are worth the trip all by themselves!). And all of this is just an hour and a half from Boothbay, and almost exactly the same from Boston. The boardwalk at Venice Beach is colorful in a way that only California could be, from its open-air gym to its Snapchat glasses vending machines (a rare collision of Muscle and Silicon Beaches). 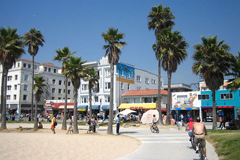 At around 1.5 miles, the Venice Beach Boardwalk is lined with artists and street performers, restaurants and cafes, and every type of tchotchke dealer one could seek. And it’s steps from the gorgeous beaches of both Venice and Santa Monica (the latter connected to the boardwalk area by bike and walking path). It even has its own elevated view, with the rooftop lounge at Hotel Erwin acting as an observatory deck for those who want to see the colorful craziness from a birds-eye view. 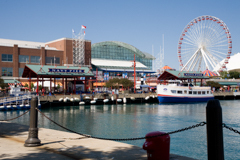 Is Navy Pier a boardwalk? Well, who says you need an ocean? In Chicago, Lake Michigan substitutes for the Atlantic or Pacific, and the 101-year old boardwalk and pier has become a center of all things Chi-town. Giordano’s is on premises for those seeking the famous deep dish pizza, while Riva Crabhouse provides an upscale seafood experience. Dining and sightseeing cruises are constantly departing from the Pier, as well, and the landscaped green surrounding it all gives visitors a chance to picnic on a warm day. Beyond Wrigley Field, there may be no attraction in Chicago that appeals to such a wide swath of the city’s visitors. 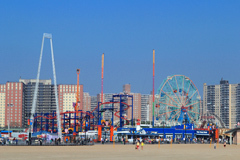 When it comes to this quintessentially American class of attraction, though, Coney Island may be the one that comes to mind first. This New York institution, back at full strength after being battered by Hurricane Sandy in 2012, welcomes hundreds of thousands of tourists and locals each year. As seen in countless films, the Ferris wheel here has become a symbol of the New York beyond Manhattan’s skyscrapers. On the ground, classic fair food is in abundance, along with the sorts of carnival games and attractions that may scratch that nostalgic itch for your donors. This year, more than 39 million people will get on the road for the Memorial Day weekend, according to AAA, the most in 12 years. And not all of them can go to the three destinations we highlighted three years ago here on the blog. There is never a bad time of year to visit New York; even in the dead of winter, there’s so much to do and see. But the Big Apple makes this list for two reasons: Springtime, even if it’s late spring, is always a time of high spirits, thanks to locals being able to trade coats for sunglasses, and Fleet Week begins. The annual celebration of the Navy, Coast Guard and Marine Corps features the Parade of Ships, Meet the Pilots question-and-answer sessions, and even air shows featuring Naval and Marine aircraft. Even for New York, the energy on the streets during the festivities is peaking. Las Vegas lives for three-day weekends, and Memorial Day weekend is no exception. The city comes alive with visitors, especially from nearby Los Angeles, and every restaurant, nightclub and resort puts its best foot forward. And while it’s hard to point at any individual event as being only for the holiday weekend, the massive number of shows in the city mean there’ll be plenty to do. Visiting the south during the Memorial Day weekend makes perfect sense. Getting to the Sun Belt before the more oppressive summer heat arrives in June. That’s true for Charleston, one of our favorite cities, with an average high temperature of 85 in May, against 90 in July. Maybe as importantly, the lows in May still get down to 63 degrees, making evening walking tours extremely comfortable. And with Memorial Day weekend also being the kickoff of Spoleto Festival USA, which brings artists from around the world to South Carolina, there’s plenty to do while enjoying the weather’s last hospitable days. Triple threats. Renaissance men or women. Swiss Army Knives. We have plenty of names for them, but they all come back to the same idea: People who are versatile, who have skillsets larger than one discipline. We have Swiss Army Knives in fundraising auctions, too. Those are the items that can attract bids from anyone in the room, the types of lots that encourage activity from all corners. They can be the most lucrative, because of the number of aspirants, and certainly can be the most fun. And often, they’re travel packages. There are some locales in our catalog of non-profit fundraising auction travel packages that cater to so many different constituencies, they become indispensable auction items, the type that get everyone in the room involved. If you don’t have an idea in what your big-money donors are interested, or you just want a location sure to please the widest base of donors, consider one of these options. Los Angeles: Even with all the high-minded literature and the sheer number of films made about the City of Angels, Steve Martin may be the one to get Los Angeles right in “LA Story,” when a character calls it “a place where they've taken a desert and turned it into their dreams.” The beaches to the west and the mountains inland, the bustle of downtown Los Angeles and the small town feel of Larchmont Village, the exhibits of newest museum The Broad and the silliness of the iconic Laugh Factory, downtown’s architecture and Elysian Park’s Los Angeles Dodgers: Any city the size of L.A. will have to contain multitudes. Paris: The City of Lights is thought of often as the home of tremendous landmarks like the Eiffel Tower and Arc de Triomphe. While that’s true, the city has a tremendous number of sides to show. Paris’ gourmand credibility has never been questioned, of course, and the cocktail renaissance is growing as well. It’s a home for culture, both high (the Louvre) and pop (the nightclubs of the city are commonly filled). And sports fans get to see one of the best soccer teams in Europe, Paris Saint-Germain, ply its trade. New Orleans: The city of Bourbon Street and the French Quarter is also the city of Frenchman Street, one of America’s hallowed grounds for jazz. It’s the capital of Creole cuisine, for the gumbo fans, and the birthplace of the Sazerac and the Hurricane. From an architectural standpoint, it’s a fascinating place, with examples of buildings and homes in nearly every major style since the 18th century. It’s a city that hosts three major festivals each year: Mardi Gras, the New Orleans Jazz Fest and Essence. And in the fall, the New Orleans goes crazy for the NFL and its Saints. No matter the donor or supporter, there’s always something to do in the Crescent City. What ISN’T New in Fundraising Auctions? We’re less than a week away from the Association for Professional Fundraisers International Fundraising Conference, or AFP for (mercifully!) short. Each year, fundraisers from around the country gather to talk about where the industry is going, best practices and the future of fundraising technology. We love being involved in these conversations, too, but as the start of the conference draws close, we thought it’d be worth a moment of time to talk about what isn’t new in fundraising auctions. The next app or big data tool are incredibly important to the modern fundraiser, sure, but there are some aspects of fundraising auctions (and the travel packages that sell at them) that don’t shift over time. Auctioneers. We’ve written before about why you want them. They keep the party going, they get the biggest bids and they’ve got the ability to get more information about your non-profit to the audience. Plus, their experiences working with numerous charities means that they can give suggestions about program order, starting bids and even what items to offer. They’re worth every penny and more. Trusting your donors. It can be scary to offer up big-ticket items at a fundraising auction. What happens if no one bids? What if the auctioneer is left there, holding the gavel? In order to raise big amounts of money with a charity auction, you’ve got to offer some items that will require big donations. If it’s an item that some of your supporters want, like a once-in-a-lifetime trip or tickets to a major sporting event, you’ll be surprised at how much they’re will to pay, knowing that the money is going to a good cause. Having FUN! At no point should the event itself feel, to you, like anything less than the greatest night of the year. This is your chance to talk with others who are passionate about the same issues, to enjoy a night out on the town and to raise money for a worthy cause (yours!). Fun is absolutely contagious, and if you’re having it, others will have it too. Saying “thank you.” And say it to everyone. From a practical standpoint, it gets your name in front of everyone’s eyes one more time. But it also gives them the chance to feel recognized for whatever they brought to the evening, whether it was donating an auction item, bidding on one, or even simply cheering on the bidders. The best views aren’t always the easiest to find. Being in the midst of the concrete jungles of modern life often makes it more difficult to see the beauty all around; sometimes, it’s elevation that’s needed. Thankfully, there are hiking trails near many of our favorite destinations that can give your donors not just the outdoors experience or the exercise that they desire, but also postcard-worthy views that inspire awe and makes a traveler want to plan return trips. Philadelphia: The City of Brotherly Love’s renaissance over the last decade has done wonders for its status as a tourist destination, but one aspect that’s always been strong in Philadelphia has been its abundance of hiking opportunities. There’s the Schuylkill River Trail, a marathon-length route that starts near the city’s Museum of Art and runs along the waterfront (and close enough to the historic Manayunk Bridge, reopened in 2015, that a side trip may be in order). Ridley Creek State Park, just outside of Philadelphia proper, is more than 2,500 acres of trails, fly fishing and horse riding. And for the “urban hikers,” the city also has more outdoor sculptures and murals than most cities in the country. Los Angeles: Hollywood? Sure. Beaches? Of course. But very few would associate Los Angeles with hiking. However, the city has not only a tremendous network of trails (the Backbone Trail, which runs 70 miles through the Santa Monica Mountains, starts in neighboring Malibu), but many that are accessible for those staying in urban areas: Griffith Park is the one of the country’s largest urban parks, with trails heading in every direction, while the Runyon Canyon hike is a beginner-level stroll that attracts people from all walks of life. Many of the city’s iconic views come from a trail; the Hollywood sign is best seen either from Griffith Park or the Mt. Hollywood Trail, while the trails at Ernest E. Debs Regional Park have some of the best views of the downtown skyline. Telluride: Of course, one might have more of an expectation of outdoor beauty in this Colorado favorite. But until your donors are standing at the summit of Ajax Peak, or overlooking the mountain village from Beak Creek Falls, it can be hard to sum up just how breath-taking views from a simple hiking trail can be. During the warmer months, the Bridal Veil Falls (the largest in the state of Colorado) attract visitors from everywhere, and both snowshoeing and cross-country are very popular on some of the trails in the winter. For the experienced hikers, a journey on the Sneffels Highline will take the visitor deeper into the mountain backcountry. In the overall picture of beer sales in America, craft breweries are still only a small portion. According to the Brewers Association, microbreweries and other craft enterprises had just a 12 percent market share in 2015, and 20 percent or so of beer sales. However, in a year where total beer sales declined by .2 percent, craft sales went up by 12.2 percent. That’s a lot of beer sales numbers for a travel blog, we know. But here’s the reason why their important: No one is going to travel for Budweiser. But if any of your donors are beer connoisseurs, they will want to hit the road to find their favorite small brewery, to try the latest trend in the craft world or just to spend a few days, much like wine fans, hopping from taproom to taproom. With Mitch-Stuart’s non-profit fundraising auction travel packages, we can help. When it comes to destinations where beer springs to mind immediately (especially two days before St. Patrick’s Day! ), it’s hard to outdo Dublin, Ireland, home of Guinness. A brewery so old and storied it has its own attached seven-story museum, the St. James’s Gate Brewery offers tours, tastings, and one of the best views of Dublin from its “Gravity Bar.” But Dublin is a great city for the beer-oriented tourist in addition to the famous brewhouse; Irish Red Ales and other craft libations are flourishing, with 50 different labels across the country. Closer to home, the craft beer scene in Portland has earned its reputation as America’s best. The city has a tremendous variety of smaller-batch porters, lagers and ales available, with more than 60 breweries in operation. But what may set the Oregon city apart from the competition is its loyalty to the home team (or home beer, in this case): According to a CNN report, more than 50 percent of the draft pints served in the state were brewed there, and the share of supermarket sales for local beers hovered around 40 percent. And restaurants as varied as Apizza Scholls (which The Oregonian called “the best pizza in Portland” in 2015) and the old-school steakhouse RingSide Grill delight in their ability to serve up local pints to pair with their entrees. Finally, any list of American beer cities that doesn’t start with Portland will almost invariably lead off with San Diego. The sunny southern sibling of Portland offers craft breweries in almost every neighborhood, including ones that tourists are likely already visiting (La Jolla and the Gaslamp District are each home to multiple microbrew options). Many of the local taprooms and alehouses also love throwing food-and-beer events; the San Diego Brewers Guild’s events page lists soirees like “Brew-n-Donut Pairing” and “Cupcake and Beer Pairing.” Combine all of that with the natural charms of the Southern California town and San Diego becomes an incredibly attractive destination. One of the biggest clichés in film, other than the “homely” woman who magically becomes irresistible when she takes off her glasses, is when a director or screenwriter tells an interviewer that “[insert city here] is really like another character in the film.” While there may be a monument or two in a movie that indicate where the story takes place, it’s not every day that a film’s location matches its spirit, the feeling one may have while visiting the metropolis. The Sunday, “La La Land” is up for Oscars in 14 different categories, and the credit in part goes to Los Angeles. The vision of Hollywood put forward in the musical is intoxicating, and in many ways does feel like the real L.A., where dreams are made and dashed on a daily basis, and life happens in between working towards the goals. There may be no better marketing for a destination than a film set in a specific locale. With its colorful song-and-dance sequences, “La La Land” may compel your donors to add Southern California to any list of dream vacations. But Los Angeles is certainly not the only city in our Destinations of Excellence catalog to which a winner of a fundraising auction travel package can fly. Here are a few more places that have received flattering – and, in terms of spirit, accurate – portrayals on the silver screen. There is no city more wide open, where more is possible, than Chicago in John Hughes’ classic “Ferris Bueller’s Day Off.” When the titular character commandeers a parade float to lead seemingly the entire populace in singing “Twist and Shout,” it has the same energy as a teenager sitting in his or her bedroom, singing into a hairbrush. While New York and Los Angeles both get tremendous press as the cities where dreams come true, thousands pour into the Second City each year from smaller Midwestern towns to chase that freedom. And in wide-open spaces like Millennium Park and along Lake Shore Drive, Chicago can feel just as open to that freedom as anywhere. Who hasn’t wanted to fall in love while zooming around Rome on a Vespa (or, maybe, a faster mode of transport)? “Roman Holiday” is a classic of the “Hollywood on the Tiber” era, when many filmmakers from around the world were drawn to the Italian capital, and movies like “Ben-Hur” and “Cleopatra” were shot there, giving a sort-of old-school romance to a city steeped so much in history. Today, the images of Audrey Hepburn and Gregory Peck – and, by proxy, Rome – are almost a shorthand for carefree love. (Just, please, if you do ride a scooter around Rome, wear a helmet). For city spotting, though, there may be no better film than “Paris, je t’aime,” the anthology film featuring short stories in neighborhoods all over the French capital. With so many different backdrops, the movie is one of the most wide-ranging depictions of Paris committed to the big screen; for once, the city is shown as being so much more than the Eiffel Tower and the River Seine. In addition to physically happening everywhere, its stories cover the gamut – tales of the domestic workers, the tourists, the aging lovers, the city’s diversity – while showcasing the French sense of whimsy. There’s a magic in the film that might only be felt standing on the Pont des Arts, the bridge where the Locks of Love once lived, and facing out towards the lights of the city at night. The television-created holiday of Festivus turns 20 years old in 2017. The alternative Christmas “for the rest of us,” the “Seinfeld” joke featuring an airing of grievances and “feats of strength” went from the small screen to a favorite theme for December get-togethers, complete with the Festivus Pole. Of course, we at Mitch-Stuart love our more romantic non-profit fundraising auction travel packages, to destinations like Paris and Italy. But we also love it when our trips are used for friends to reconnect, to make new memories, or even just to get out of town for some relaxation. (And it’s good for the non-profit, too – groups of friends can buy multiple trips to make sure everyone gets a room, meaning more money for the charity.) Because of that, we think that Galentine’s Day is as good a reason as any to send your donors on one of these adventures. Lovers enjoy trips to Hawaii, of course, to the point that we offer a package that includes a vows renewal on an Oahu beach. But friends can also find their versions of bliss on the islands with a trip that includes a spa visit. Packages like our “The Essence and Spirit of Aloha” or “Pacific Vacation Paradise” feature gift cards for massages, facials and any number of other spa services on site at the resorts. And with either a volcano tour or the excitement of Waikiki Beach, respectively, waiting for after the spa, there’ll be plenty to chat about on the way home, too. “Parks and Recreation” also launched a smaller fake holiday, where two of the secondary characters take a day off from work for indulgences and shopping trips (“Treat Yo’ Self,” it’s called on the show). That’s not a bad theme for a trip for friends, either; the combination of time away from the stresses of the day-to-day and some additional retail therapy ay set your donors up for ultimate relaxation. Mitch-Stuart has travel packages that can send supporters to San Francisco, Newport Beach and Chicago with gift cards for sprees at Nordstrom, or even the grand prize of four nights at The Plaza with a $2,000 credit at Tiffany & Co., Saks Fifth Avenue, Bloomingdale’s or Bergdorf-Goodman. Those looking for fun with their friends out on the road would also do well to head to Napa Valley for some winery tour adventures. Send your donors on a limousine tour through boutique wineries, let them dine on three-course gourmet lunches and, most importantly, compare notes while trying some of the best wines in America. A long-time destination favorite for groups of friends, a Napa Valley trip package is sure to attract the supporter looking for a journey with their longtime acquaintances. On Sunday, the New England Patriots and Atlanta Falcons will face off in Super Bowl 51, to a television audience in the nine figures, along with more than 70,000 in-person spectators. The entire week leading up to the game, football will be inescapable, with the NFL Experience fan zone already underway and overwhelming media coverage clogging every outlet. It doesn’t sound like a place for the non-football fan to go. However, it turns out that the attention of the sports world focused on one city becomes quite a magnet. While the week’s festivities may be leading up to the big game on Sunday, the array of music, food and revelry on offer goes far beyond football. Mitch-Stuart is proud to offer a trip to the Super Bowl as one of its non-profit fundraising auction trip packages. Our “Winner Takes All at the 2018 Super Bowl” trip includes four days and three nights in Minneapolis for next year’s championship game, and while football will be the focus of the outing (thanks to two tickets to the game), there’s plenty more to do wherever the Super Bowl is taking place. The Parties: Wherever the Super Bowl goes, exclusive soirees usually follow, with celebrities and open bars aplenty. But not every get-together in the lead up to the game is guest-list dependent. This weekend, for instance, the Big Texas Party (with barbecue, local beers and celebrity guest appearances) will draw both the pigskin addict and the food fan, while raising funds for local charities. Between benefit brunches and late-night revelry, it’s possible to attend a party at the Super Bowl morning, noon and night for almost a full week. The Music: The jocks and the band kids may not have mingled much in high school, but it’s no longer a Super Bowl without a list of major concerts. Musicians from around the world descend on host cities to play for large audiences (and in some cases, large appearance fees paid by brands anxious for the publicity). This weekend, acts like Solange, Leon Bridges and ZZ Top will all play for free at the Discovery Green in Houston. And for those with some contacts and some favors to call in, invite-only shows are a Super Bowl weekend tradition; Taylor Swift will be playing this weekend at the DirecTV party, a celebration that has, in the past, played host to Dave Matthews and Jay Z, among others. The Food: Super Bowl host cities are almost always hubs of foodie culture. That’s more an accident of location and size than a planned correlation, of course; any event that goes to places like New Orleans on a regular basis has to incorporate local cuisine in some way. But the NFL has made sure to draw culinary influences in from around the country; the yearly Taste of the NFL event brings together more than 40 of the nation’s top chefs, with at least one from each city with an NFL team. It’s a way of letting your tastebuds travel the country, all in one place – and, for one year, without the goopy queso dip at your friend’s Super Bowl party. On January 20, thousands will crowd the National Mall to watch the peaceful transition of power, as Barack Obama departs the White House and Donald Trump officially gets the front door keys. The next day, thousands more will march in the nation’s capital, protesting the policies of the incoming administration. There are few countries in the world who recognize such a transition of power with the pomp, circumstance and agitation of the United States. But that doesn’t mean that America has a monopoly on inaugural celebrations. The international side of our catalog of non-profit fundraising auction travel packages includes some national capitals that recognize a new leader with parades, ceremonies in historic squares, and even fireworks and garden parties. In France, the inauguration ceremony is a private affair, almost completely held behind closed doors at the Elysee Palace, the president’s residence. But to mark the occasion, there are often parades, tributes and speeches for the public as well. Of course, it takes little to want to organize a parade when one has access to one of the most iconic thoroughfares in the world, Paris’ Champs Elysees. Throw in a stop at the Arc de Triomphe, and the supporters who line the famous street get a celebration worthy of the office. One of the newest republics in Europe is Croatia, and thus far its four presidents have each given their inaugural addresses in St. Mark's Square, in the capital city of Zagreb. It’s the home of St. Mark’s Church, along with the parliament building, the high court of the country and even the Banski dvori, the seat of the Croatian government – an incredible amount of power in a one square block space. Just to visit the square is worth the trip; the brick street and the baroque architecture contribute to a feeling that belies the country’s young age. Of course, while they are rare, the celebrations of the accession of royalty may be the most over-the-top – and the most fun to attend. Even in a small principality like Monaco, no expense is spared; when Albert Grimaldi became Albert II, Prince of Monaco in 2004, it involved a garden party for 7,000 and fireworks over Monte Carlo. The accession is still celebrated; ten years after taking the throne, Lady Gaga, Tony Bennett and Robbie Williams each performed concerts and chefs prepared the world’s largest fougasse (a French bread similar to focaccia).